Another Malaysian Airlines Boeing 777 plane was lost today with 280 passengers and 15 crew aboard. Flight MH17 was on route from Amsterdam to Kuala Lumpur. Malaysia Airlines confirmed that Ukrainian air traffic control lost contact with Flight MH17 about 30 miles from the Russia-Ukraine border. The plane appears to have been shot down over eastern Ukraine by pro-Russian separatists using an older Soviet Union built BUK (aka SA-11 or SA-17) anti-aircraft missile system supplied to them by Russia. The Ukrainian government does not have any anti-aircraft missile batteries in the eastern counties controlled by the pro-Russian separatists, nor has it lost any such equipment to them. Immediately after the airliner was shot down, the pro-Russian separatist leader Igor Strelkov (whos real name is Igor Vsevolodovich Girkin) bragged on social media Internet sites that they had shot down a Ukrainian Antonov An-26 transport plane, and warned the Ukrainian government to stay out of their air space. Once it became known that it was a civilian airliner that had been shot down, Strelkov's postings on Facebook and Twitter disappeared. Strelkov served in the Russian FSB (the successor agency to the Soviet Union's KGB) for 18 years from 1996 to March 2014. The airliner was flying at a normal height of 10 KM (33,000 feet), so it could not have been possible to shoot it down using a simple shoulder fired surface-to-air missile, as those have a maximum range of 15,000 feet. 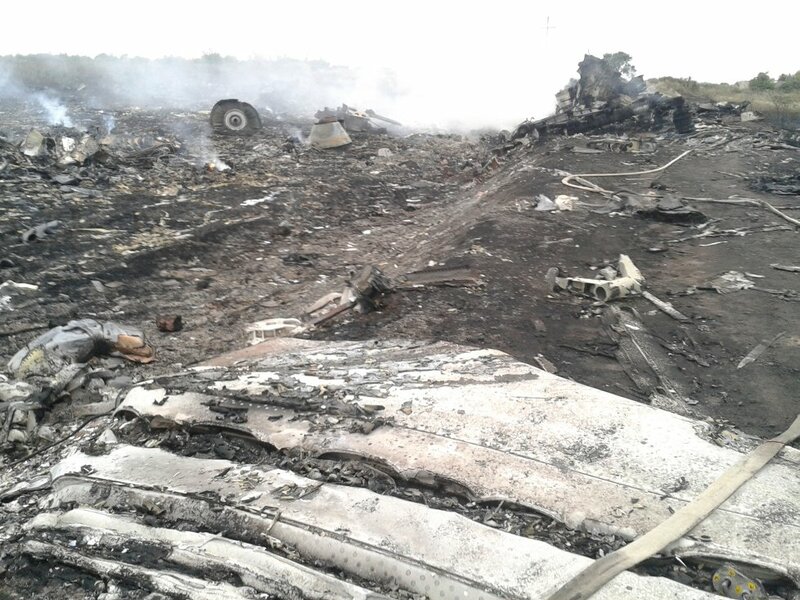 The plane went down by Torez, close to the city of Donetsk, around 40 KM from the Russian border. The crash site is a gruesome scene, with corpses and body parts spread over a 15 KM radius area. The real blame in this incident belongs to the Russians, who have irresponsibly escalated the Ukrainian conflict by providing the pro-Russian separatists in eastern Ukraine with advanced weapon systems such as tanks and anti-aircraft missile batteries. The Russians are also providing the rebels with their key leadership personnel, such as Igor Strelkov. Many international airlines have avoided flying over Ukraine in resent months, due to the conflict situation there. From today, they will all likely avoid the region. As can be seen on the FlightRadar24 web site, the flights between Western Europe and East Asia are now taking a more southerly route over Turkey. Really heart rending to see all the news coming in; especially profiles and interviews with relatives. Most of the dead were of Dutch origin. Hope our Yak is alright. The passenger count has been revised to 283, making the total number of lives lost 298. The pro-Russian separatists are currently preventing the disaster personnel that has arrived from getting full access to the site. They have apparently removed the black boxes from the wreckage, and also appears to have been looting some of the passengers belongings. Dutch banks have reported that attempts have been made to use some of the dead passengers credit cards. A Ukrainian surveillance video shows a BUK missile launcher with one of its four missiles missing being driven on a flatbed truck towards the Russian border by the pro-Russian separatists. Several telephone conversations between the pro-Russian separatists and their Russian superiors immediately after the attack on the airliner were intercepted and recorded by Ukrainian security. Prime Minister Narendra Modi's Boeing 747-400 aircraft flew over Ukraine just minutes before Malaysian Airlines' MH17 was shot down over the northern rebel-held part of the country, killing 298 people on board. All Israeli commercial airliners have been equipped with directional infrared countermeasures or DIRCM pods that jam incoming missiles. The pods were installed after an Israeli-owned chartered airliner was targeted by, but escaped, two shoulder-fired surface-to-air missile launched by Al Qaeda operatives near Mombassa in Kenya in 2002. That prime minister of India Narendra Modi's plane flew the same route just minutes earlier, means that he was very, very lucky that day. The German airline Lufthansa also flew a plane along the same route shortly before the incident. The anti-missile defensive measures installed on Israeli airliners are not used by airlines in other countries. Nor would they have been effective in this case. The Israeli airliners have defensive measures designed to work against inexpensive, short range, shoulder fired, heat seeking surface to air missiles. Such measures are not effective against missiles that have a radar locked aim, servo controlled via radio telemetry from the ground based radar installation. But surely there must be some way to avoid surface to air missiles. Or is an aircraft doomed once it is radar locked ? Am still wondering why (motivation) someone fired the missile that hit MH17. Was it intended for someone (else) ? (07-20-2014, 02:08 AM)radiobox Wrote: But surely there must be some way to avoid surface to air missiles. if surface to air missiles were easy to avoid, they would serve no purpose. But am not sure how exactly surface-to-air missiles (SAM) operate. There must be some way to throw them off. Aren't "flares" effective as a countermeasure ? Found an informative and active thread. electronic and conventional countermeasures are very expensive to maintain and are also restricted items that civilians are not normally allowed to play with. the best way to avoid a missile besides avoiding the missile is to avoid areas where someone is likely to target you with a missile.